Today I want to discuss in detail Oeko-Tex which is likely to be one of the more recognised product labels on the market. The Oeko-Tex association is headquartered in Zurich and was founded by the Hohenstein Institute (based in Germany) in 1992 with one other founding member. Today the membership stands at 18 independent testing and research institutes across Europe and Japan. The Oeko-Tex website contains a full list of current member institutes . Collectively, these institutes are responsible for establishing and maintaining the Oeko-Tex certification standards which currently totals 5. The Standard 100 aims to give consumers confidence in the safety of products certified with this standard. Only products that have been tested to meet the strict criteria of the certification are permitted to carry the label and must pass annual re-testing to maintain their status. 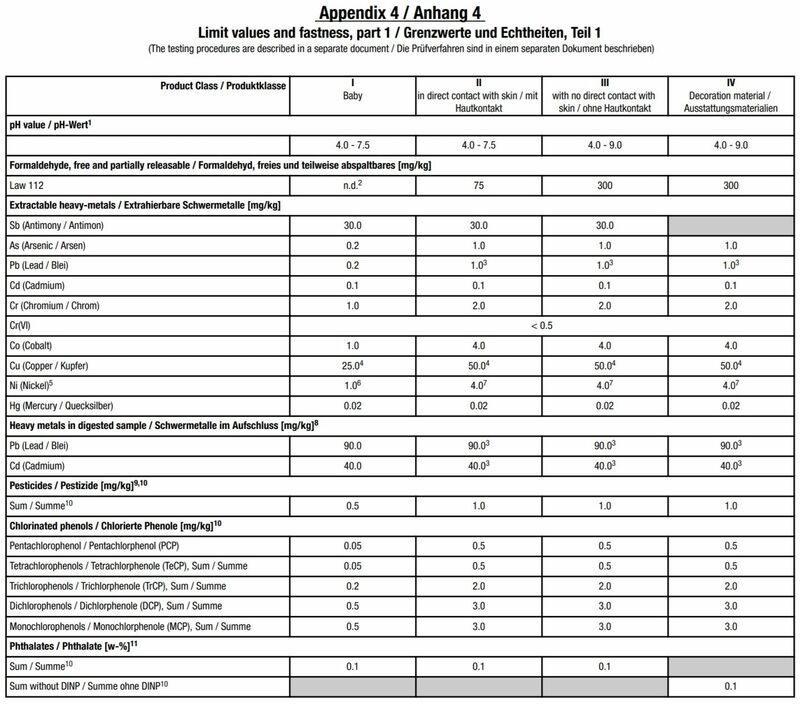 The Standard 100 sets limits on which substances can be used, to what extent they are permissible and how to test for them. The standard applies to any textile product and considers all forms of materials (i.e. raw, semi-finished and finished). This includes but not limited to; raw cotton, leather, dyes, zips and buttons. Testing for substances can occur at all stages of processing. This means even the raw materials are tested for chemicals before the manufacturing process begins. As an example, something like a T-Shirt would fit into Product Class 2, however a Jacket would fit into Product Class 3. The above comes directly from the appendix section of the Oeko-Tex standard and is an example of a requirements limit value. In the above example, baby products are not allowed to have any Formaldehyde (commonly used finishing agent which gives products their 'wrinkle-free' status), on the other hand, a decoration is allowed 300 mg/kg. 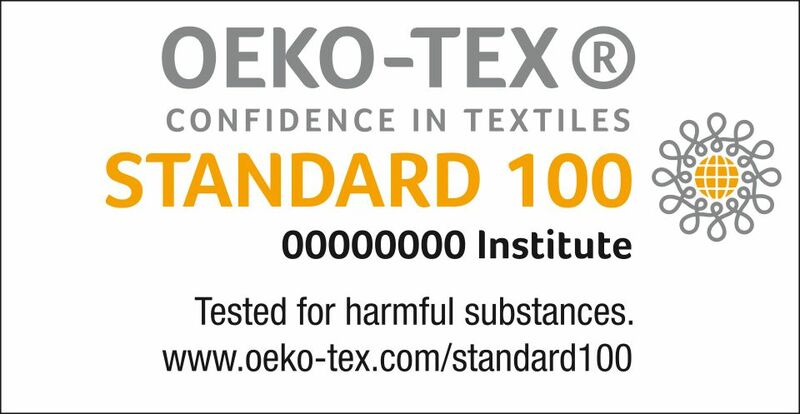 Needless to say, that if the product you are looking at carries the Standard 100 by Oeko-Tex label on it, you're in good hands and you're looking at one of the safest textile products on the market. Product safety is a concern for any consumer, but also of concern is how an item was manufactured. STeP provides assurances for the sustainable and social responsible practices of manufacturing processes. Seeing this certification means that the Oeko-Tex has assessed the practices of a manufacturer in areas of management of chemicals, environmental performance, environmental management, occupational health and safety, social responsibility and quality management . All this means that there are good environmental practices, waste management is handle appropriately, workers are happy (no child labour) and paid fairly. Sustainability practices vary drastically from one country to another. Having a globally recognised independent certification system provide clear criteria makes sense for all the same reasons why it does for the Standard 100 certification. Unlike the Standard 100, STeP by Oeko-Tex (prior to 2013, known as the Standard 1000) does not have a product label, rather, it acts as a means for business to advertise to other businesses their compliance. If you are a business wanting to partner with like-minded sustainable businesses globally, you can quickly establish trust with businesses carrying the STeP certificate without needing to assess these manufacturers manually. A pair of jeans has its buttons made by a STeP certified manufacturer, but the cotton is sourced from a non STeP certified manufacturer. What label is reasonable to put on the jeans? Listing each manufacturer could be garment in its own right, and ultimately not helping the consumer. Made in Green is a traceable product label and is superior to the Standard 100 label in that it combines the Standard 100 and STeP certification standards. Made in Green is only awarded if all of the Manufacturers involved production of the product are STeP certified with some leniency is awarded to Wet/Chemical production facilities. The Made in Green label is traceable using the Product Id (which is printed on the Product Label itself. 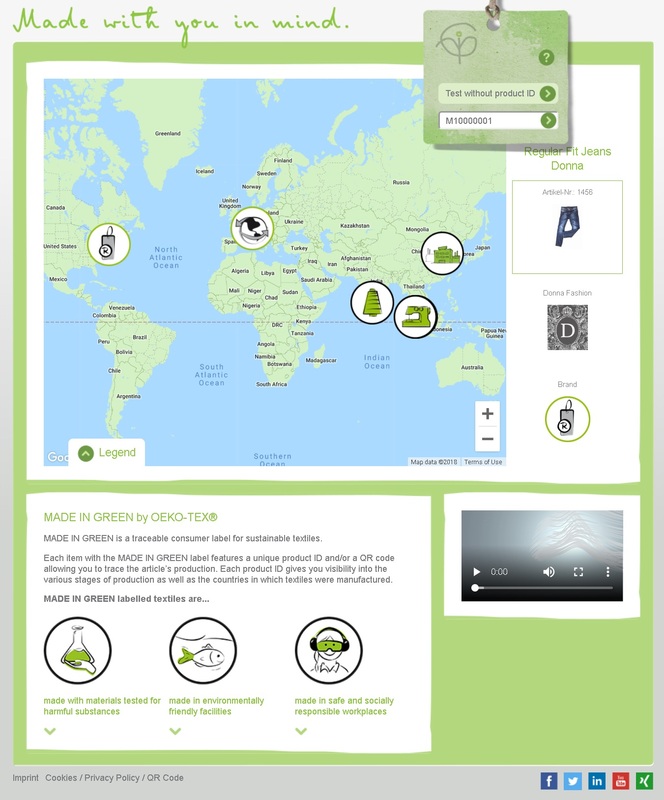 Using the made in green website you can lookup the id and get detailed product information including all the manufacturers involved in the production. The Leather Standard by Oeko-Tex is a recent addition (2017) and borrows heavily from the Standard 100 by Oeko-Tex and more appropriately sets limit values for Leather based products. Leather production relies more heavily on certain chemicals such as Chromium which is more tolerable in leather goods than other textiles which makes. Because of this Leather compliance with the Standard 100 was previously not attainable. The Eco Passport by Oeko-Tex is a certification for manufacturers of chemicals intended to be used in the textile industry, examples would include chemical dyes, cleaning agents, and adhesives. This Eco Passport is issued to producers of chemicals and makes compliance easier for textile producers knowing that the chemicals they source from Eco Passport certified producers are going to meet Oeko-Tex criteria. In summary, Okeo-Tex aims to ensure the highest standard of product safety and does this using different certifications pitched at different levels of the textile chain.